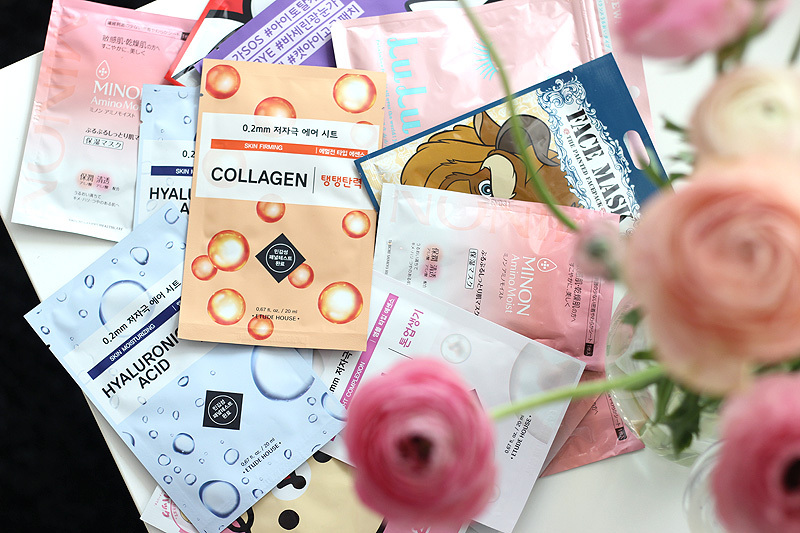 As a girl with troubled skin that likes to fake a healthy complexion, it'd an understatement to say that I am quite addicted to good base products. Primer, foundation and concealer are definitely my weapon of choice in the morning & which specific one I choose depends on the state of my skin. It's been either good or pretty bad off and on, so I do stock quite a few different ones that I switch between depending on the necessities of the day. So needless to say that I was pretty excited when I found the super new cushion foundation by Lancôme on my desk: Miracle Cushion (with SPF23). Cushion foundations are highly popular and nothing new in Asia and more specifically Korea where this type of foundation launched, but for Europe this is definitely a novelty. We've had the BB and the CC, but the cushion.. Brand new! Are you as excited as I am? The foundation looks like it might be a compact powder, but it's actually a liquid foundation that comes in a sponge called 'cushion'. The little cushion is drenched in product, with extra product underneath of course. The plastic product case including the cushion can easily be clicked out, so there's no need to repurchase the whole compact every time which wil save you a little more than a quarter of the price! There are refills available of each of the six available shades that you can click right back in. The compact also comes with a handy built-in mirror because this is supposed to be the easiest liquid foundation to carry with you on the go and do touch-ups with. 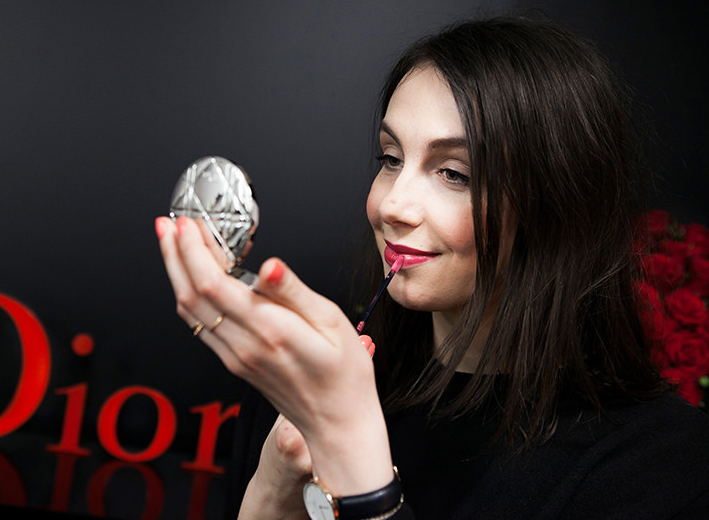 I usually do touch-ups with a bit of concealer and powder, but I can understand that for a dewier complexion you might want to carry this one with you instead. It is a pretty big case though, so this wouldn't necessarily fit in your party clutch.. 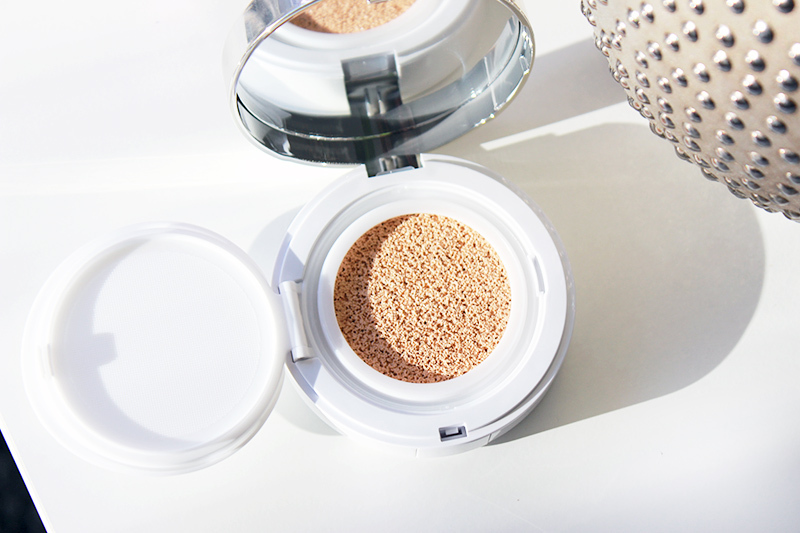 The compact comes with a special round applicator made with polyutherane - it looks like the ones you'd usually find in powder compacts, but this one feels smoother and a bit plastic-like. This makes the sponge washable, which is definitely desirable if you count on applying your foundation with it daily. It feels a little weird when you first apply the foundation with this sponge - I was torn between swiping, patting and just giving up. I definitely ended up majorly over-applying on the first day of using Miracle Cushion (sorry to my friend who I had a pancake date with), but on the second day I found the right way to apply after some thorough investigation. I pick up a little bit of product each time, smooth it out over my skin in swiping motions and reapply in a patting motion on areas that need some more coverage. I like to 'push' in the product on areas that would normally tend to be a little flaky - I do have quite oily skin, but somehow my nose area for example can be quite dry. I've never encountered a foundation that wears as good on the nose area as this one does. A lot of foundations will reveal dry patches around my nose or will fade away the quickest in that area, but this one does no such thing. I was ah-mazed! As the foundation is so thin you can build coverage easily, although you should keep in mind that it will always range between a light and medium coverage. It won't take you to full coverage. It's very au naturel, so if you have acne it will definitely show through. I use extra concealer on acne I really want to conceal. As you can see the foundation perfectly conceals large pores and pigmentation, but still allows a healthy flush to peep through. The finish is very, very dewy. After studying Lisa Eldridge's last video about Korean makeup trends (view it here), this must be that Gwang effect Korean girls are after. I wore the foundation without powdering it off and the Gwang definitely kept on giving, perhaps even a little too much on my combination skin.. The foundation didn't wear that well when used without a primer or powder, but I think this was mainly due to my oily t-zone. If your skin is dry I can imagine it to last much longer - although wearing a primer is always a good idea if you want your makeup to last all day. Yesterday I wore it to work with a primer underneath and a powder on top, which definitely made the perfect combination! The pretty glow was still visible, but my oily t-zone did not go crazy. With a primer (Rouge Bunny Rouge's Original Skin Primer) and powder (Burberry Fresh Glow Compact Foundation) it lasted all pretty much all day. Towards the evening it did fade on my chin (I tend to touch my chin often I noticed) and had some extra shine going on around the T-zone, but it can be easily fixed with a powder & foundation touch-up. I was a little biased at first due to the texture and finish, but Miracle Cushion doesn't perform bad at all! The compact does contain less product than regular fluid foundations you'd purchase in a bottle, but I also think I use slightly less product than with those other foundations. I'm not entirely sure though as it's hard to see how much product the applicator picks up every time you push it down the cushion. I will keep using this foundation like I do with my other favourites and will report back on how long one of these cushions actually lasts. The compact including foundation (14ml) retails for €42.00. Afterwards you can buy refills for €30.00, which is definitely much more budget proof. There are only six shades available at the moment, so finding a shade match might be a little tricky. I use the lightest shade (no. 1), which is just right for me (I am usually an NC15 in MAC terms.) Maybe more shades will be added if the launch does pick up.. Let's hope this kicks off a year filled with much more makeup launches with Korean/Asian influence!